Buy any goods/services at any of the selected KK Group of Companies* (no minimum purchase). 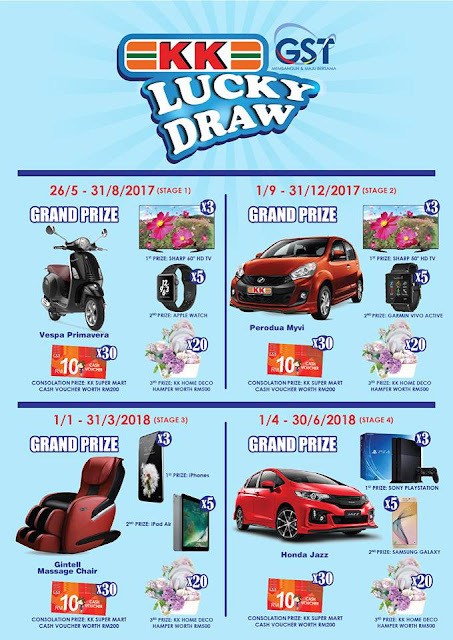 *includes all KK Supermart & Superstore Sdn Bhd, KK Home Deco Sdn Bhd, KK R&R Sdn Bhd, KK Marketplace Sdn Bhd, KK Motorsport Sdn Bhd, KK Kopitiam Sdn Bhd and selected Donutes Bakery Café (Kuchai Lama, KLIA, Avenue K & Eco Sky). Check annoucement on KK Facebook page & media. If you are one of the winner, contact KK HQ to collect your prize. Visit KK-GST Receipt Lucky Draw Campaign terms & conditions for more details. Don't miss out: Toys R Us Hasbro Clearance Sale, with discount up to 80%!